You see the bar down there on the ground. You've never picked up something quite so heavy before, but you've been training for months to do just that. So you get in perfect position, generate every bit of strength and tension your body and mind can muster, and then...up it goes. You drop it with a loud clang, the chalk and dust settles, and the moment is over. Or is it? Countless strong people have discovered that the triumph of a PR is only the beginning of where training's benefits begin. Once they're outside of the gym, they see enhancement in their physical abilities, their mood, their ability to work, and even their ability to build meaningful relationships. To show how, we've gathered true stories from real people who also happen to be ErgoGenix athletes. 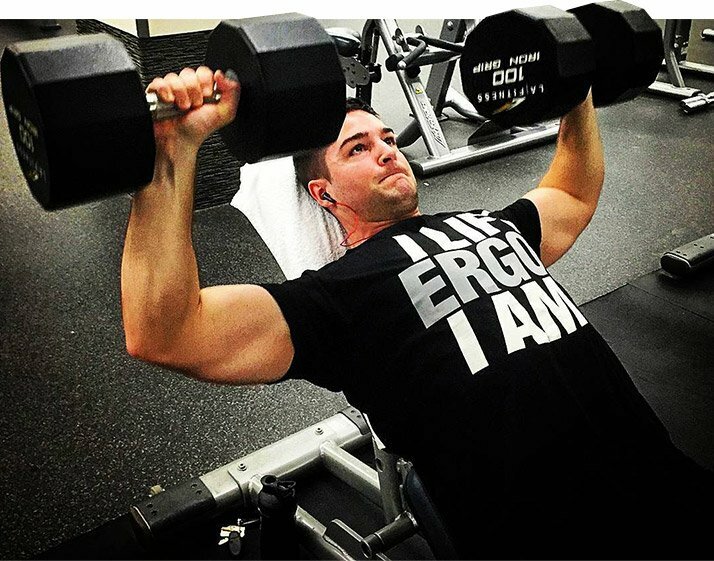 Read on as they share what it means to say, "I Lift, Ergo I Am." The F-word gets tossed around a lot, and it can be tough to know what "functional" really means. But people who do hard work outside of the gym have always known it's the ability to do what needs to be done. Get stronger and sure, it'll be easier to carry the groceries upstairs, shovel snow, and cart the kids around, but some of the best benefits of lifting will appear when you least expect them. "I fondly remember my first 'what the hell' strength moment," recalls aspiring powerlifter Jordan Grise. "I drove over to help my father at his plumbing, heating, and air conditioning business. He was called away before I arrived, and after waiting for nearly an hour, I decided to start the job myself. I picked up a water softener which was still full of lime from the second-story utility room and carried it all the way outside. Then I lifted it and put it in a dumpster. This task, while simple, would have normally taken at least two men, but I managed it all alone." Those small moments aren't necessarily glamorous, but they make you realize just how different the lifting life is—and how much more control you have over your abilities than you probably realize. When you're a young athlete at school, you both train and compete. But once you're out in the world, they both become choices, neither of which is mandatory. Guess which one gets dropped first? The training, of course. And soon enough, people get stuck in a fixed—and false—idea of their ability level on the pitch, the course, or the court. Get serious about lifting at any age, though, and you'll almost definitely also see a boost in your sport of choice. "I played hockey as a teenager, and back then, my time in the weight room definitely benefited my sport," explains student athlete Christine Learmonth. "Today, I still love weighted sled sprints, because I find they carry over incredibly well to not only hockey, but also snowboarding." Plenty of people go crazy with this idea and start doing things like attaching golf club handles to the cable stack machine. You don't need to. Unless you're competing at a truly high level, simply focus on the big stuff: Getting stronger, better conditioned, more athletic. It'll pay off plenty. Physical training is hard, because it's honest. No matter your goal, you won't see meaningful results overnight; you need to dedicate time and effort daily to see success. You'd better believe this is a good life lesson. "Sure, lifting has not only made me more confident, but it's also taught me patience," explains Grise. "I used to take every shortcut to get the results I wanted, but now I fully understand that the best things always stem from hard work, smart planning, and consistency. That's something I took straight from the gym." Plenty of people go to the gym the first time for physical reasons, but by the 500th time, many people are there just as much for the mental and emotional benefits. "Lifting is great therapy," notes Army medical student Patrick Campbell. "Doing battle in the weight room definitely helps me stay level-headed outside the gym." Your strength sends a message to those around you. It tells them they have a choice. To people who aren't in the know, it can be hard to see how repetitively picking up and putting down weights can make stress dissipate and improve your outlook, but to Learmonth, it was a game changer. "I've struggled with depression since I was young," she explains. "Of all the things I've tried to help me deal with it, working out has been the most effective strategy by far. Having something productive to put your energy into while seeing the progress I've made is incredibly helpful for staying above the 'funk.'" In the weight room, you make the choice to struggle, feel pain, and push yourself to discover new limits. And for many, this ritual leaves them feeling grateful simply to be alive and able to experience something so intense. "Descartes' original quote, 'Dubito, ergo cogito, ergo sum' or 'I doubt, therefore I think, therefore I am,' is a foundation of western knowledge for a good reason. The act of doubting, and thus thinking, alone proves our existence," explains Learmonth. "When replaced with the ErgoGenix slogan, 'I Lift, Ergo I Am,' training becomes the validation for our existence. Training grounds me, gives me something to look forward to, and reminds me every day how fortunate I am to be able-bodied, strong, and capable." 'I Lift, Ergo I Am' encompasses all of these things and more in five short words. "That phrase touches on many of the most important things to me," Learmonth says. "It means being grateful for what you have, taking care of your body, and pursuing activities that genuinely make you feel alive." Push your limits regularly, and you'll appreciate not only all you can do, but all you could do. Few activities can offer something so profound while also helping you look and feel your best. Serious training isn't just a hobby; it's a skill that demands consistency, determination, and the willingness to put your ego aside. Not so coincidentally, these also happen to be characteristics of great employees, students, and friends. It's not a stretch to say, "Lift more, achieve more." "Before really diving into this lifestyle, I was very good at just skating by," explains ErgoGenix athlete Josh Moore. "During my first few years of college, I wasn't really committed to doing what it takes to be successful. This lifestyle has helped me realize how disciplined and consistent I can be when I set goals and work toward them." For Moore, this has translated to pushing himself in his current career and helped him prepare for the next one. "I'm heading back to school to knock out my bachelor's degree, and after that, I plan on heading to law school," he says. "I didn't always see it this way, but lifting has taught me that progress is happiness." That loaded barbell is more than just a heavy object; it's a challenge you can choose to walk up to or run away from. Sure, you might fail, but then again, you might not. Only one way to find out, right? That's something it shares with that guy or girl who might be the romantic PR you've been searching for. "If I didn't gain confidence and patience from the gym, I don't think I would have ever asked out my beautiful and amazing girlfriend," says Grise. "Before, I may have just jumped at the first opportunity to be with someone. Instead, I continued to work on improving myself until one day, months later, I felt confident enough to ask out the beautiful, passionate, hard-working girl I now adore. Lifting taught me to surround myself with people like her, who not only hit their goals, but demolish them." Too often, strength and fitness get cast as "selfish" activities. This view sadly underestimates the impact your physical practice can have on those around you, from your friends, to family members, to coworkers. 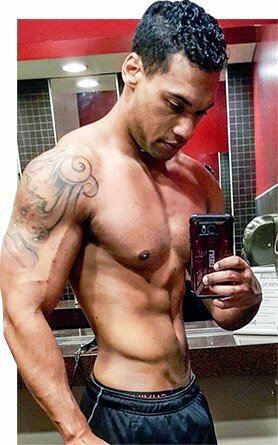 "Embracing lifting and nutrition as a lifestyle has opened up so many doors," says Moore. "I've realized the harder I work and the more noticeable the progression, the more people are willing to reach out to me for help when it comes to their own personal goals. That may be one of the most rewarding benefits lifting has given me." Make no mistake: Your strength sends a message to those around you. It tells them they have a choice. They're not stuck with who they are right now. No matter their background, age, or goals, they can grow, surprise themselves, and build a better life. Tell them, and tell the world: I Lift, Ergo I Am!